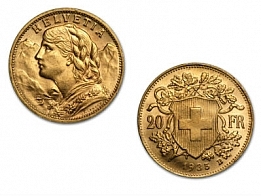 Suisse Gold sells Swiss Vreneli coins for secure vault storage or worldwide delivery. The Vreneli is the only significant gold coin produced by the Swiss government. Each Vreneli contains approximately 5.8 grams of gold. Swiss Vreneli coins are popular, particularly amongst European gold investors. Vreneli gold coins are available for worldwide delivery or for vault storage.